Personnel from Singapore's Air Force standing alongside members of the New Zealand Defence Force in the Christchurch Botanical Gardens. 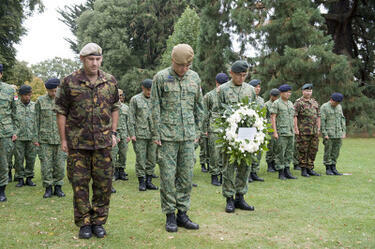 The personnel were laying a wreath in memory of those who lost their lives in the Christchurch Earthquake. 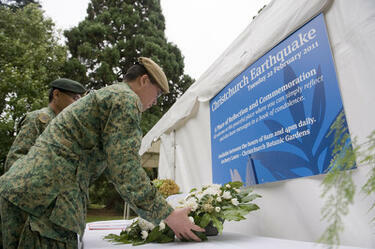 A member of Singapore's Air Force laying a wreath in the Christchurch Botanical Gardens. The wreath was laid in memory of those who lost their lives in the Christchurch Earthquake. 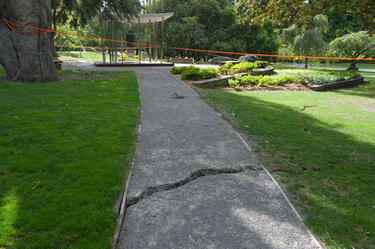 A large crack in a footpath at Christchurch Botanic Gardens. 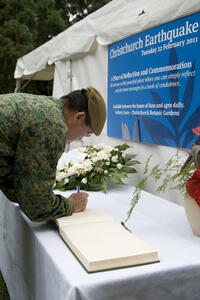 A member of Singapore's Air Force writing a message in a memorial book in the Christchurch Botanical Gardens. The book was placed there for those who wanted to pay tribute to the people who lost their lives in the Christchurch Earthquake.